Concepts drive every creative and practical task, plan, and project, but managing those concepts—inviting, capturing, sharing, and analyzing them—can be a daunting prospect. It’s fraught with challenges such as how to organize disparate ideas, link similar thoughts, and give equal consideration to the contributions of numerous participants. There are numerous types of concept mapping, but most, says Michael Huffman, associate manager of operations at Concept Systems, involve individuals working alone and in a free-form manner to manually organize the relationships among their own ideas, a process known as mind mapping. According to Johnny S. Kim, PhD, LICSW, an associate professor in the University of Denver’s Graduate School of Social Work, who has used Concept Systems’ software for numerous projects, “It provides a unique way to identify, conceptualize, and visually represent thoughts and ideas regarding program characteristics and outcomes.” The multivariate statistical techniques it employs, Kim adds, are particularly useful when examining complex problems for social issues such as dropping out of high school. “Concept mapping is much more than the software,” Davis says, suggesting that the crux of the process is the concepts. But Concept Systems’ program, which she describes as a “tool to help structure, visualize, and understand the information gathered,” is integral to the process. One of the software’s key features is the ability to democratize the process of conceptualizing a plan or project and organize input from multiple sources without referencing a hierarchy of contributors. “With a typical internal planning or problem-solving process at a corporation, the executives or board members usually steer the course for the company,” says Huffman, who observes that group input tends to be more valued within social service or academic organizations. Concept mapping lets multiple groups of participants—those in disparate groups, participants across staffing levels, and individuals in different geographic locations—to take part in the brainstorming and analysis process from start to finish, Davis says. “Because concept mapping provides a practical approach to program evaluation that uses information from multiple stakeholders in assessment and evaluation of community programs, it’s ideal for use in social service and educational programs that combine information gathering with problem-solving activities to produce practical solutions,” says Kim, who notes that the problem-solving approach makes it especially useful in social work practice. Concept mapping and concept-mapping software can be employed in a wide range of social work settings and as a tool for accomplishing many of the profession’s key objectives. Davis says its use is well established in strategic planning, needs assessment, and program evaluation, and it has been proven effective among culturally diverse populations. “As a research method, it provides a sound approach to exploratory and descriptive research,” she adds. Furthermore, Huffman says many social workers have relied on concept mapping in academic settings as well as in community-based participatory research. 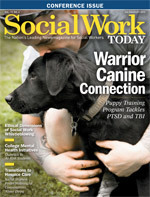 Kim says among the tasks for which concept mapping is being used in social work are assessing cultural competence and perceptions of spirituality, developing measurement systems, examining program fidelity, assessing disadvantaged groups’ mental health needs, and examining community responses to trauma. Huffman says recent concept mapping with Concept Systems’ software includes a project with students, staff, and faculty at a major university to determine what needs are not being met for lesbian, gay, bisexual, transgender, queer, and questioning students and, at a medical school, an effort to determine the issues that affect students’ well-being and create a plan for programs to address those issues. Davis has used concept mapping for research and planning with numerous organizations and systems, several addressing diversity-related interests. “I’ve used concept mapping with multiple systems of care as an exploratory research approach to further social work’s understanding of the complex construct of cultural competence and to provide service systems with information to improve their cultural competence with children and families,” she says. Kim has found concept-mapping software to be a key tool in his research. He employed it recently in a study exploring student perspectives on behavioral and school-related changes following participation in a child savings account program. Using concept mapping helped answer the study questions because it permitted him to incorporate the students’ perspective. “It allowed for a richer understanding of how assets obtained through child savings accounts affected the high school students’ academic and behavior goals,” he explains. Kim suggests that social workers interested in learning more about concept mapping explore William Trochim’s introduction to the subject: “An Introduction to Concept Mapping for Planning and Evaluation.” Additionally, Davis advises neophytes to explore the growing literature base in social work on the use of concept mapping for research, evaluation, and planning to see how social work researchers and practitioners have incorporated the approach in their work. — Kate Jackson is an editor and freelance writer based in Milford, PA, and a frequent contributor to Social Work Today.